U.S. News released its annual rankings of the best U.S. law schools earlier this week. Many students apply to grad school believing that another degree will impact positively on their choice of jobs or their salaries. According to the Bureau of Labor Statistics (BLS)’s employment forecast published in the summer of 2018, they may be right. The BLS forecast the jobs in master’s-level professions would rise by close to 17% between 2016-2026, and jobs in doctor’s level and professional-level occupations would go up by approximately 13%. 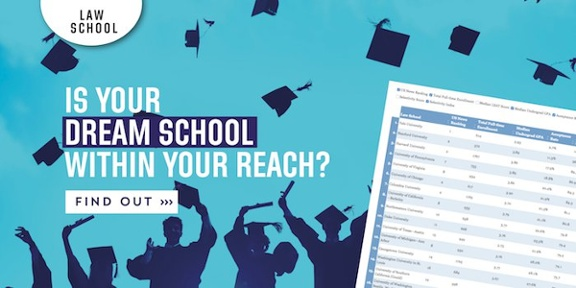 Check out the 2020 U.S. News law school rankings to see how you measure up against other law school applicants at your target programs. U.S. News bases its law school ranking on expert judgements about program excellence and statistical information that tries to capture and reflect the quality of a school’s faculty, research, and students. Peer assessment data gathered from deans, program directors, and senior faculty also contribute to the ranking. They were requested to evaluate the quality of programs in their field on a scale of 1-5, with 1 being marginal and 5 being outstanding. This year, U.S. News added the GRE analytical writing score to both the full-time and part-time Law ranking methodologies. Prior to this ranking, only the GRE quantitative and verbal scores were utilized. This is also the first time in the nine law school specialty rankings that the average peer assessment among legal teachers instructing in those fields was used. This caused a very large gain in the number of schools ranked in each of the nine areas, which include tax, legal writing, international, intellectual property, and health law. Looking for more information on how to use these rankings to determine the best programs for you to apply to? Need advice on how to measure your competitiveness relative to other applicants at your target schools? Get in touch – our expert advisors are ready to guide your through the medical school admissions process from start to finish. View our Law School Application Services for more information on how we can help you get ACCEPTED.